Öhlins Racing's firm dedication to motocross and enduro led firstly to road racing, and then to new markets for production bikes, just as emphasis on snowmobile racing led to a new market for regular snowmobiles. More than 300 World Championship and other major titles are definitive proof that Öhlins shock absorbers offer outstanding performance and reliability. And never one to forget his roots, Kenth Öhlin sees to it that race track service and support remains an important part of the company's operations. Öhlins service vehicles can be seen at World Championship events around the globe, at motocross, enduro, superbike, road racing venues. Suspension products from Öhlins have also been dominating a couple of classes in the car-racing scene for years. Meanwhile, official distributors ensure an active presence, and support at local level. 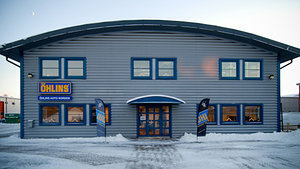 The company sells its products throughout the world from branches in Sweden (head quarter in Stockholm and Öhlins Auto Norden in Karlstad), USA (Öhlins USA in Hendersonville, North Carolina), Germany (Öhlins Distribution & Test Center in Meuspath at the Nürburgring) and Thailand (Öhlins Asia) as well as a world-wide network of distributors in over 50 countries. Between 1987 and 2007, Öhlins Racing has been majority-owned by the Yamaha Motor Company, though it continues to operate as a dynamic, independent company within the business group, but since December 2007 Kenth Öhlin owns 95% of the shares. More than 97% of the company's turnover is accounted for by the export market, equally divided between OEM business and aftermarket sales. Öhlins supplies it's products to motorcycle manufacturers all over the world, such as Aprilia, BMW, Ducati, Honda, Kawasaki, Triumph and Yamaha.